Hi Frances, thanks for your coment. I love the fact my sketches can mean different things to different people, and yes this sketch and all my sketches are available as prints. Prices start at £12 for a standard A4 print on 300gsm card. For a near perfect high quality giclee print, which is hard to tell from the original the cost is £24. Or you could purchase the original for £48, which is closer to A5 size. For a frame also add £15. Email me at contact@edinburghsketcher.com to discuss further. Hello there. Is this going to be available to buy shortly? 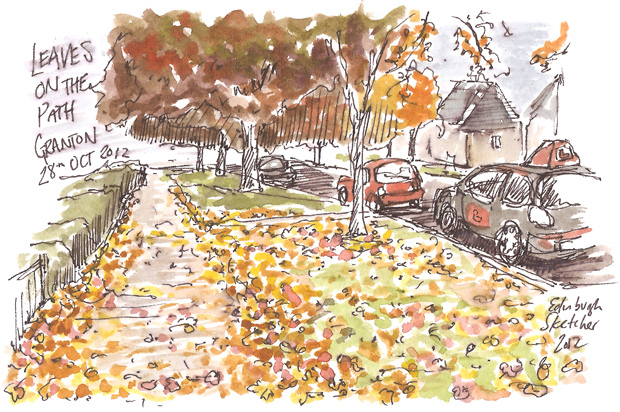 My husband lived in Boswall Drive and from the perspective of this sketch I rather think you’ve stopped outside the house he was brought up in. Both his parents are dead – his Dad in 2007 and his Mum in 2009 and I would love to give him a framed copy of this for his birthday in December. it’s lovely.